This is the story about the urban legend. When I moved to Richmond long ago, one of my first friends here asked me to drive her over to Southside to see her Dad. He was glad I brought her and wanted us to stay to eat. When he asked me about myself and found out I was new in town, he wanted to tell me things about Richmond that aren’t in the tour books. This is what he said. I asked him if it was true and he said yes. I asked him why, but he didn’t know. I thought that did bode well for Richmond, because not every community has that attitude of expecting you to come back if it is your home. And it makes common sense too. Then I didn’t give it another thought for a lot of years until my daughter, Sarah moved to Atlanta. Now, Atlanta’s a lot of fun, but it’s too far away, so I told Sarah about the urban legend, hoping she’d come back. She didn’t believe it was a true urban legend, but I said I don’t think the old timer made it up. Then one time Sarah was talking to a friend of hers who knows the urban legends here and asked about it. The friend said yes, it is a true urban legend that you will come back to Richmond. And she had another good piece of information. How to Break Richmond’s Spell. Dance Out of Monroe Park. Isn’t that great?! I could do that! hahahahah !! And here’s another good thing. Sarah left Atlanta and it looks like she might settle down in Norfolk, which isn’t Richmond, but it’s not too far and Norfolk is nice. About the painting. WHEW!! That was difficult. A few years ago I wouldn’t have even attempted to draw it, but since I’ve tried to draw architecture a few times, I thought I could do it. The perspective isn’t perfect, but it’s not bugging me, so maybe no one will notice where I went off. I had to work on it at home a lot because of the heat and humidity around here. It’s too hot out for your plein air painter. I got my colors mixed up at Legend and went back to check what I did at home against real life and made corrections. I wished the Legend Brewery themed show at Artworks was in the winter instead of Aug. I painted the sky at home on a couple rainy days, from imagination. The windows. I didn’t use my ruler for the windows, but I used my #2 round brush as the width of my lines. It’s easy to paint skinny lines if you paint in the couch with Maroger Medium. I hoped to catch the reflections. To check my lines I look down the edge of my canvas the way you look down the edge of a piece of plywood to see if it’s warped. I had to try to paint the windows even though it was time consuming. The thought of the buildings without windows sounds nightmarish to me. The city is more than just boxes made of steel and concrete. It’s layers of people working. I wanted to paint the Federal Reserve so it would shimmer a little. So I did a layer of cool gray and let it dry. Then went over it with a glaze of warm white and scraped through it with a comb to show the first layer of gray coming through. And went over the lines with my palette knife scratching off more lines of paint. 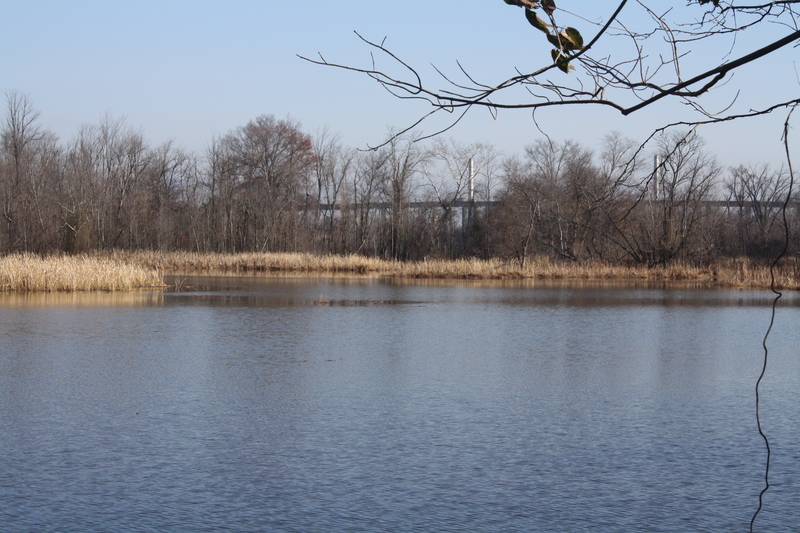 The James River. I mixed up my colors on the floodwall. I didn’t copy nature, but arranged the rapids so some would fit in. Then I faked the river in at home. 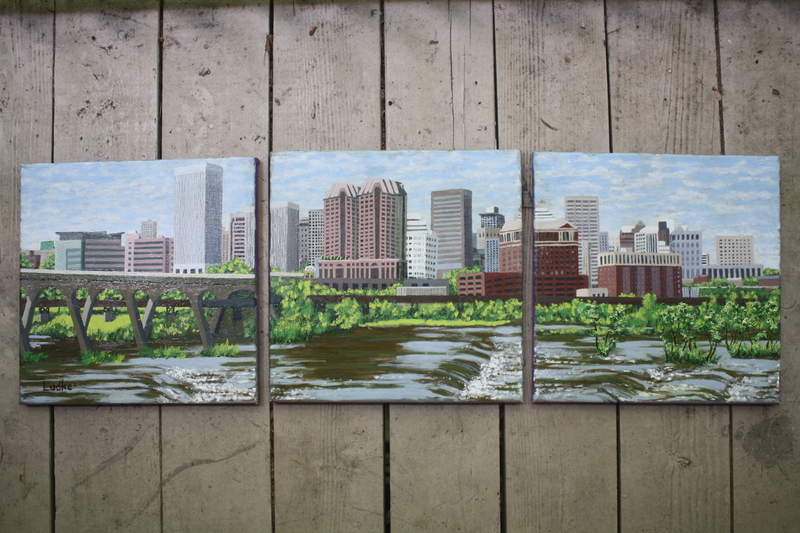 by chris ludke in Art, city scape, Drawing, landscape, oil painting, plein air, Richmond VA. 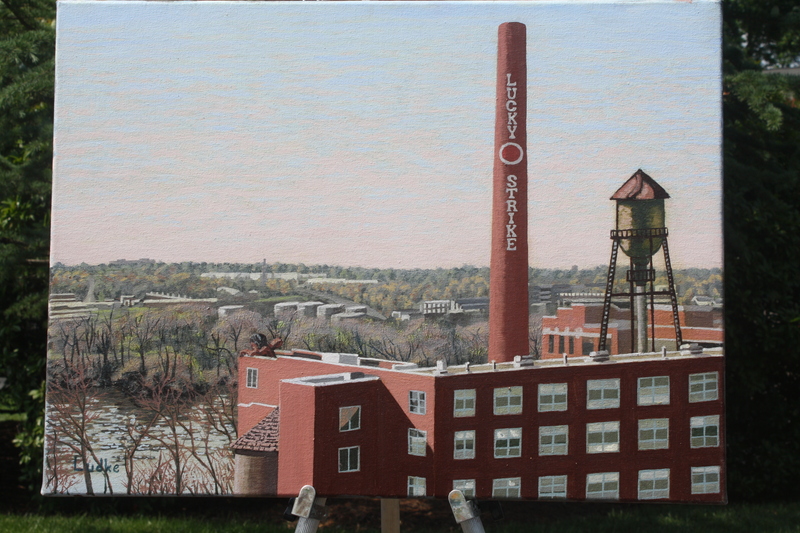 Tags: art, Cincinnati, Glen Allen Cultural Art Center, James River, Libby Hill, Lucky Strike, oil painting, Paul Di Pasquale, plein air, Richmond VA.
Metaphorically speaking, this painting talks too much. 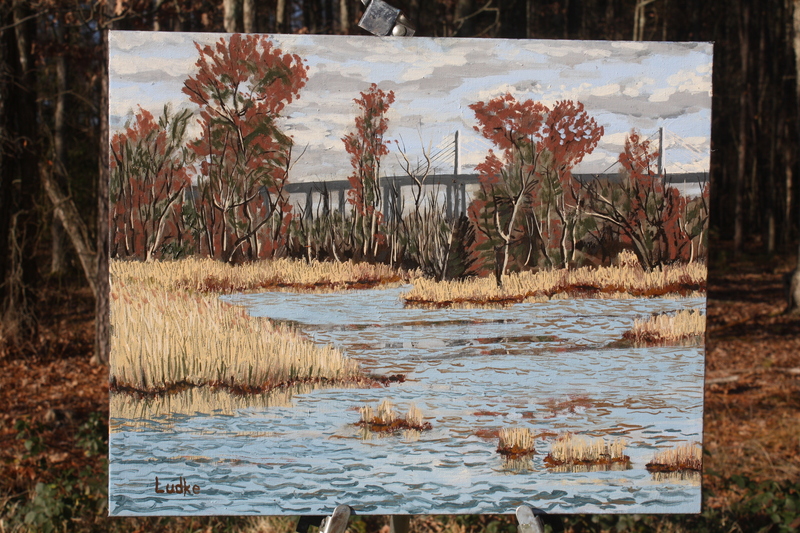 I painted it in the winter, but saved it till now for my show at the Glen Allen Cultural Art Center in June. I want to invite everyone to come out on June 2 from 6 to 9. They will have a lot of art and performances, food and drinks. It will be fun! OK. What is it this painting won’t shut up about? The list goes on and on. I’ll tell you some of it. First it was about male and female, earth and sky, what’s timeless. It was about a beautiful view in a historic neighborhood that might be blocked by condos. The condo plan is scrapped for now, as far as I know. is on the roof guarding us. My view from the hill was to his back. And before I was finished with the painting, it got on the subject of good guys and bad guys, and the strange conversations I had with them when I was up there working on the painting. Funny, the cop didn’t ask me if I saw the perp, and the perp didn’t ask me if I saw the cop, so I didn’t tell either that the other one was there. It’s too much to type, but if you have the time, I’ll tell the story. About the Indian, Richmonders will remember seeing him glaring down from the eaves of the Diamond and striking terror into the other teams. 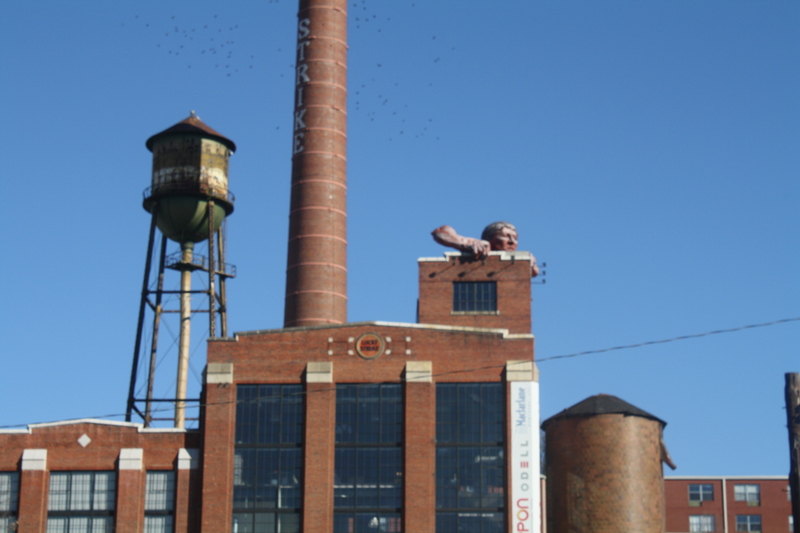 Now you can see him from Dock St. I think he looks great up there, but he’s out in the weather. My pretty city as seen from Legend Brewing Co.
Legend put out a call to artists for their participation in James River Days, scheduled for this summer. The city has a lot of events planned along the river. This art show isn’t until Aug. at Artworks, but I need to get started. 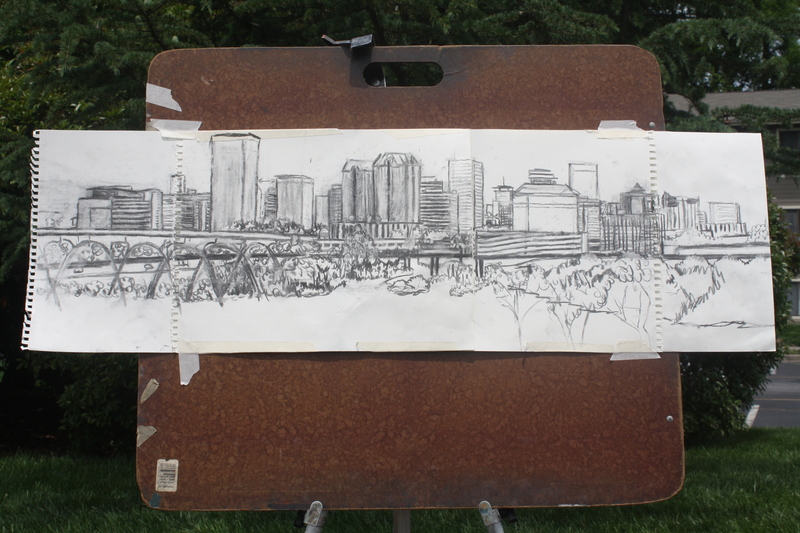 We’ve had a lot of rainy dreary weather lately, which isn’t good news for your plein air artist. It seems like we only see the sun twice a week and not for long. This weather pattern can’t last much longer. I’m excited for the chance to draw at Legend! It’s a great view of the city, and it’s friendly and safe. They have a good reputation for their craft beers too. My plan is to transfer this sketch onto three 12 x 12 canvases and paint a triptych. I’ll have to draw it again with charcoal on the canvases and make more corrections before I start on the underpainting. You can see the smeary places where I made corrections and the charcoal didn’t erase very well. And I taped four pieces of paper together to get the drawing up to 36″. I tried twice to get a start on the sketch and didn’t get anything I could work with until the 3rd try. Then I used the width of the Federal Reserve building (the tallest one) as a unit of measure to check the scale as I went along from West to East adding the buildings. It might not be exactly accurate, but it’s not too far off. The temptation when I’m trying to draw buildings is that they keep getting bigger as I go along. That tells me my drawing is out of control, stop and check the proportions again. So, sometimes I check the proportions by measuring with a pencil held out at arm’s length, and sometimes I just eyeball the scale. It’s going to be a challenge to paint this. You’re invited to my opening! I want to hang this new painting at the library but I’m not sure it will be 100% dry. Sometimes I put a painting in a frame for a show, and later it sticks to the frame and I have to touch up the color on the edge. This time, I’m putting a thin strip of tape on the inside edge of the frame. If the paint sticks to the tape, I think I can get it out of the frame and warm up the tape with a hair drier to get it off without messing up the paint. I hope you will come down to the library and have a look at my paintings in person. I’d like to hear any suggestions or comments. 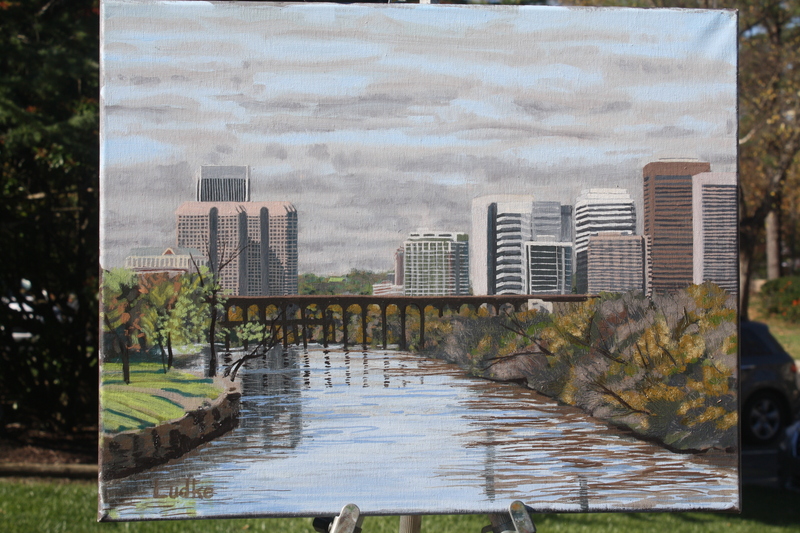 This painting is “Richmond in Nov.” looking west over the James from Rocketts Landing. Does Realism show reality? Is my work Realism? I wish I could answer yes or no but I can’t decide. On one hand I’d say no because reality changes so fast and I work slowly. I think of a photo of being closer to reality than my painting but the camera lies. My naked eyes lie too. The camera can’t show depth as well as my naked eye sees it and flattens the colors too. Then on the other hand, as I’m trying to paint what I see, I’m making decisions and changes every step of the way that take the painting away from reality. 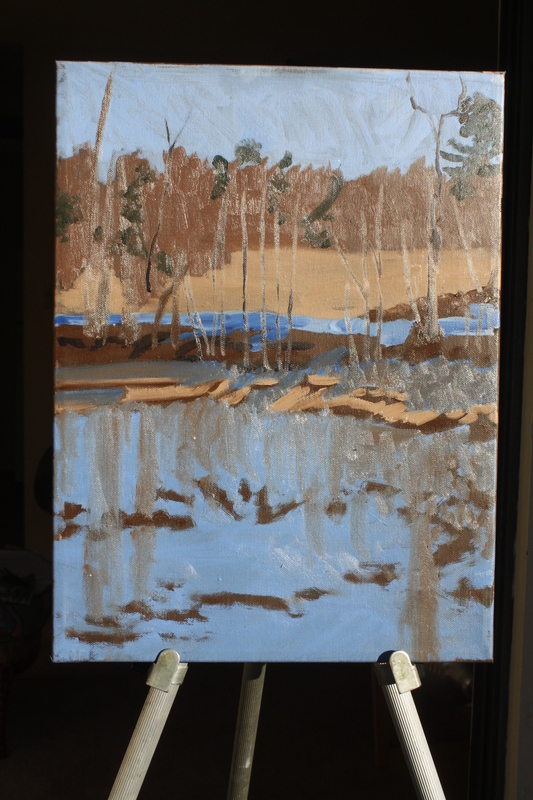 When weather permits, I go to the same place at the same time of day and work on my painting for a few hours. Some times the tide is out at noon and some times it’s in at noon. I have to decide which tide I want to paint. I wind up painting over what I did the time before, or faking the water when it’s all different. It’s an experiment. If it looks convincing I’ll try to do that again and if it’s not good I give up on that one and try something else. It was windy and cold that day and I had to mix some colors before painting. I took the lid off my palette and put it on the ground. Right away the wind blew the lid down on the mud about 10 ft. out. I had to climb down a steep slippery muddy hill about 5 ft. then step on two logs that are usually submerged to reach the lid. I was glad I was wearing my hiking boots. I didn’t fall into the muck. Then I used vines to pull myself up the hill again. We had a lot of wind and that makes it difficult, but if the sun’s out I want to try to make some progress on the painting. It’s not only that the wind blows your supplies away, it knocks down your easel and painting if you forget to hold on. It blows all kinds of debris into your paint and onto your wet painting. Most of it comes off easily when the paint dries. Mother Nature doesn’t make it easy for the plein air painter. It’s a color rough and composition plan. Sketching in some trees helps me get the scale. You can see so much you have to narrow it down. I decide which trees I want to draw and where I want the sky, land and water on the canvas. The dark spots in the water are the gray tint on the canvas I let show through to visualize where I want to arrange the cat tails in the end. I have to finish the painting before I can paint the cat tails so they can be a focal point on top. Graffiti / art or vandalism? 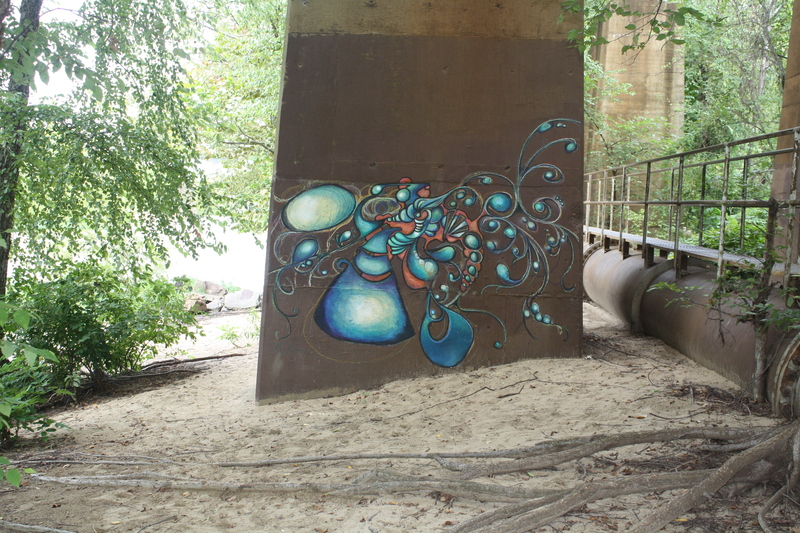 A few months ago when I was working on my painting of the James River rapids I saw the guy working on this graffiti. It looks like it was inspired by the rapids. I talked to him and he said it’s oil pastel and not permanent. I thought that the rough surface of the wall would use up the oil pastels too fast, and they’re expensive. Usually graffiti on the Pipeline Trail gets painted over right away but I was there a few weeks ago and it was still there. I’m glad to see they weren’t in a big hurry to paint over it.